The headstocks of JET guitars are topped with the same highly figured maple as the body. 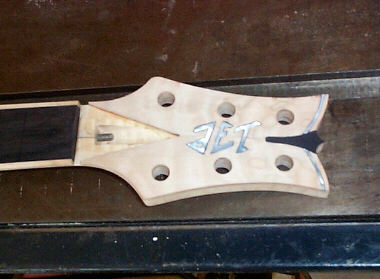 Here's a headstock with all the inlays done, before grain staining. Notice the truss rod cover is recessed. This may seem like a small feature but the devil is in the details. 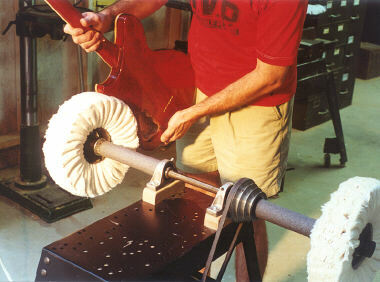 JET guitars are well known for the fine detail work that Jeff does on each guitar. In fact Jeff was probably the first luthier I know who bothered to come up with innovative ideas to improve the cosmetics, fit & finish !!! In order to achieve the most striking quilt or flame maple appearance, the top wood of both the body and headstock is grain stained. This initial stain is black, or a dark mixture of blue, brown or red, depending on the final color desired. The color of the raw wood is also taken into account for color selection as some stains work much better on certain shades of maple. The deep grain stain is allowed to penetrate and dry before sanding. Jeff uses water soluble aniline stains because they are resistant to fading over time. The surface is then sanded lightly or heavily, depending on the color recipe being used. 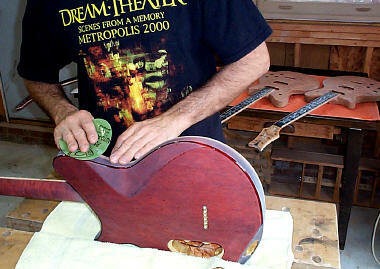 Then the body and neck are both sanded through to a fine grit. Jeff's necks feel just as good as my famous 1500 G neck that requires an unfinished neck to get the full effect. I have customers that send in their PRS & Fender guitars from all over the world to have that treatment done to their guitars. The natural wood scraped binding in the body, neck and headstock are painstakingly masked and sealed with lacquer. 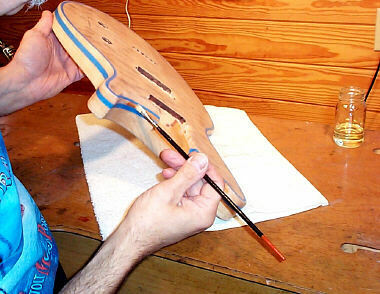 This is one of those labor intensive procedures that simply can't be done any other way, which is why some luthiers decide not to do it in their instruments. 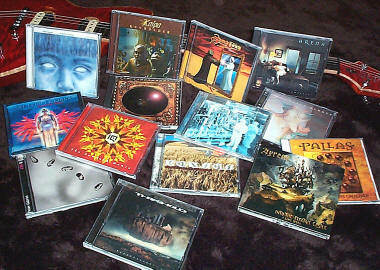 Again this is one more reason Jeff's guitars outshine much of the competition. The final top color and the back color is applied. The back is stained using Jeff's famous highly sought after hallmark red mahogany formula, which looks as great over the maple neck as it does on the Korina or Mahogany body. Although it will not interfere with the glue, care is taken to leave the joint areas unstained anyway. 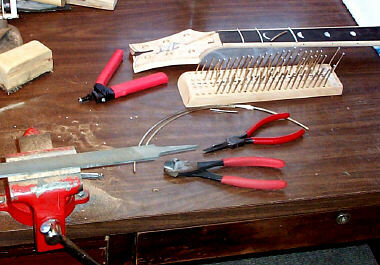 This is the fretting work area with some typical fret nipping and shaping tools. 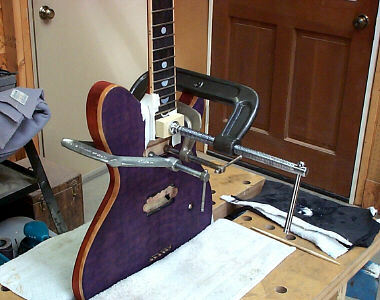 The frets are individually hand fitted and installed using an arbor press before the neck is glued to the body. Finally the neck and body are forever to be joined as one, using a special proprietary cross linking polyvinyl acetate glue, It doesn't foam like polyurethane glue, which would ruin the colors in this area. Curing is a minimum of 24 hours and sometimes two days. Many of my readers know that I generally do not favor set neck construction due to glues being so thick and stifling the tone. The JET is the only exception to this rule. I am thinking that possibly Duesenberg has something similar. Based on how good they sound. Each instrument is sprayed with a light coat of urethane grain sealer, then a poly bonding agent, then two coats of poly sanding sealer. 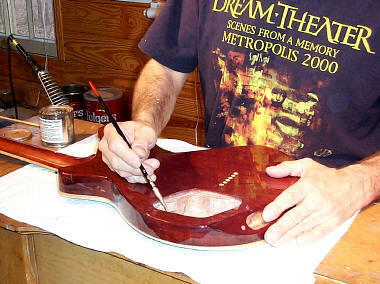 After curing the instrument is hand sanded, and then sprayed with 6 coats of very high quality poly resin clear coat for the body and 3 coats for the neck. Here are some 'victims' hung up after being sprayed. They must be hand sanded between coats. 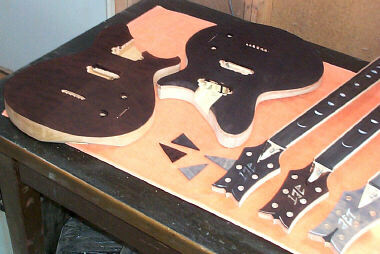 Jeff rarely does more than 4 guitars at a time and he generally can only build 4 guitars a month. 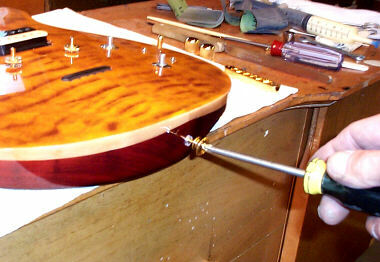 After a minimum of a week, the fully cured polyester finish needs to be rubbed out and buffed. This is the most time consuming operation in guitar making, A lot of builders go for nitrocellulose clear coating because it is easy to buff. But it's not nearly as durable a finish and dents easily compared to polyurethane. Most of the rubout is done by hand, progressing through six grades of silicon carbide wet-or-dry. 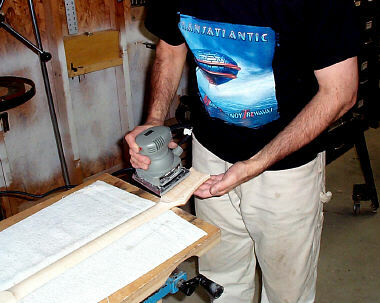 The air sander helps it go faster on the larger areas of the front and back. The paint quality is amazing on a JET guitar. Jeff has a great eye for using color combinations that are absolutely striking. Four grades of buffing compound (combined with an 'Armstrong' buffing technique) produce a smooth, mirror like finish. 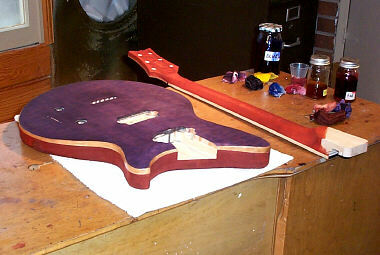 JET guitars are among the most beautifully stained guitars that we sell. Occasionally I can talk Jeff into staining & finishing a couple of my Quicksilver's. Usually the customers who insist on the JET finish are already proud JET owners. 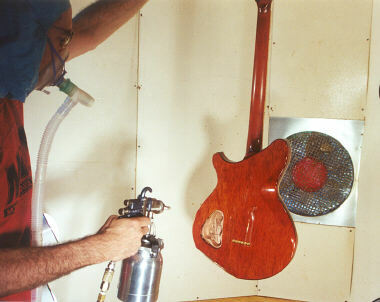 The control cavity is fully shielded using two coats of Electro Dag conductive paint. Shielded cable is used for wiring runs beyond the main cavities, so there is no chance of stray EM signals being picked up. 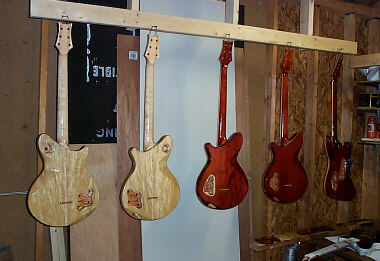 The final wiring and assembly goes pretty fast, compared to rubout and buffing of four guitars which takes almost a week. Instead of felt washers under the strap buttons Jeff uses soft clear plastic washers. After seeing the T-shirts, you have probably figured out what kind of music plays in the JET shop! "Pop music is what it sounds like at the county fair. 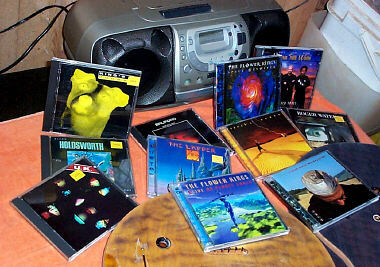 Prog Rock is what it sounds like in Heaven." 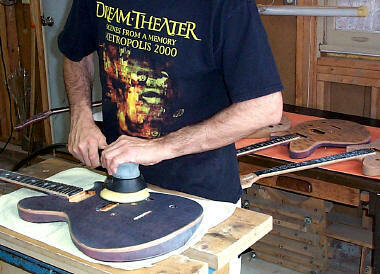 Jeff has built guitars for some of the Worlds top Prog Rock Artists.